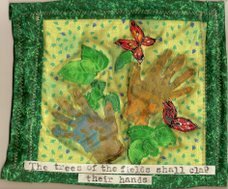 For August, the quiltie themes are "Things with Wings" and "Shades of Red". For the wings quilitie, I made wings out of wire and Fantasy Film and attached them to the paper head. 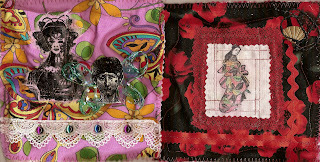 Of course, since I'm a sucker for anything Asian, I had to use the Asian theme in my red quiltie. These quiltie swaps are so much fun! I have a beautiful wall hanging with the quilties I've received..20 of them so far!